Arawak is built to cruise. Why not give her a helm system that’s up to the challenge? When I climbed aboard Arawak for the first time, I saw the strides that had been taken to refurbish a boat that had been pulled from the mangroves. To my mind, the electronics installation on Arawak is bar none the most striking aspect of her refit, and that’s saying a lot. The Awlgrip paint job is beautiful. The Yanmar engines are quiet and smooth. The Northern Lights genset is reliable and ready for action. The Technicold air conditioning is hard to beat when it’s time to sleep. 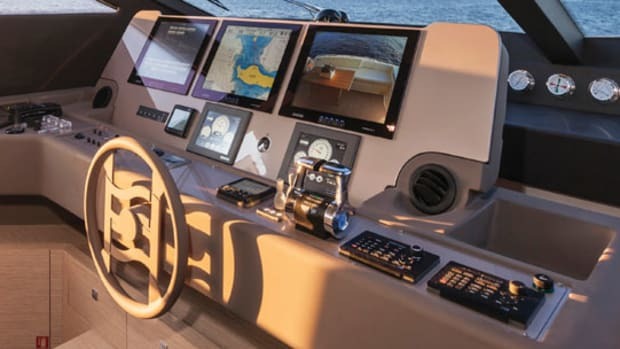 But where else but the helm can you see the latest in technology with modern multifunction displays giving you a window into an uncanny, constant flow of data, yet installed in classic teak joinery amid timeless design. 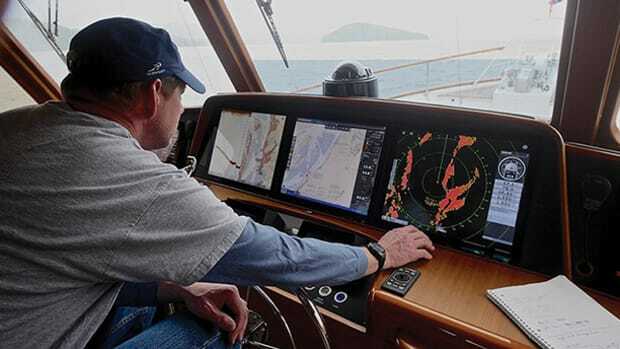 Indeed at the lower helm, using the rotary-knob control to zoom the Simrad NSS9 evo2 display, I positioned two steadying fingers on the wood itself at the edge of the unit case. Instead of new leaving old behind and consigning it to the dustbin of the past, this new chose to bring old along with it, arm in arm, and make both better along the way. Take a tour of Arawak’s helm and you’ll see what I mean. 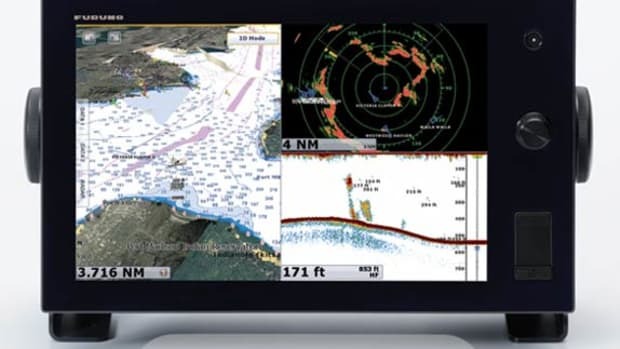 This is a networked Simrad system (www.simrad-yachting.com) that uses the NMEA 2000 protocol to link all components in such a way that all data is available along one backbone, connecting sensors, displays, cartography, engine and navigation data—everything on the network is shared. Insert an SD card into a slot on one display to load up a new chart area and it is immediately available to all plotter displays. Likewise, position information from the GPS antenna and receiver are shared with the AIS and VHF radio to enable full DSC functionality. Arawak, if you’re just joining us, is the 1996 Grand Banks 42 Motor Yacht that, as a MyBoatWorks project boat, underwent a repower with Yanmar diesels, and an extensive refit with equipment from Vetus Maxwell, Northern Lights, Aqualuma, Walker AirSep, ESI Total Fuel Management, Awlgrip and Interlux, and more. 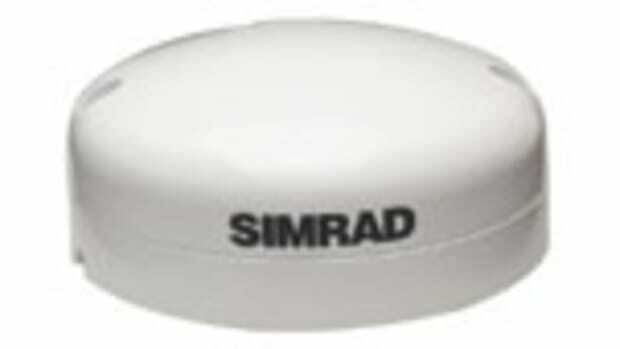 Her Simrad electronics were installed at American Custom Yachts in Stuart, Florida (www.americancustomyachts.com). Arawak has a long-term mission, however. She is being refit to resume service as a charter boat in St. Thomas. 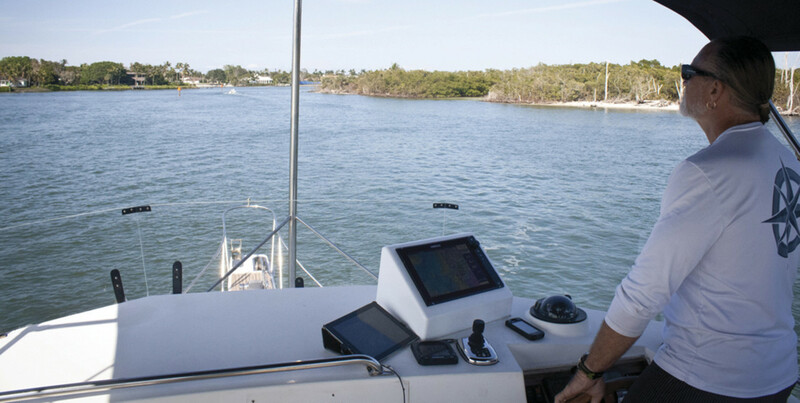 Therefore, she needs to be simple to operate for a bareboat crew, yet be able to share data and offer the deep functionality an experienced skipper would want while delivering her safely from port to port. “We wanted to give you basic navigation,” Cole says. “And yet we also wanted to show you how we can really expand functionality with today’s technology. You’ve got access to all sorts of new information on very few displays, so you get a nice, clean, sleek install, where in the old days you could have as many as ten pieces of equipment on your helm. Today it’s a multifunction display with NMEA 2000 networking. 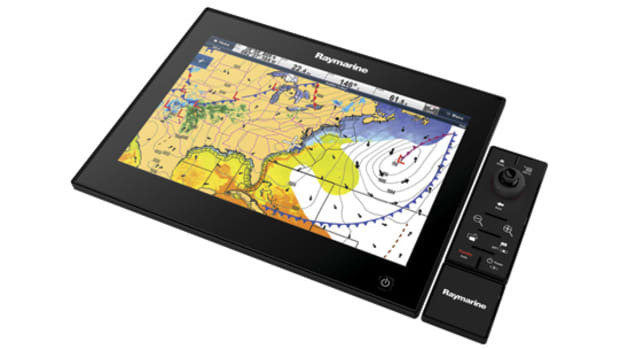 Both the NSS evo2 displays have exactly the same functionality, just different-size screens. 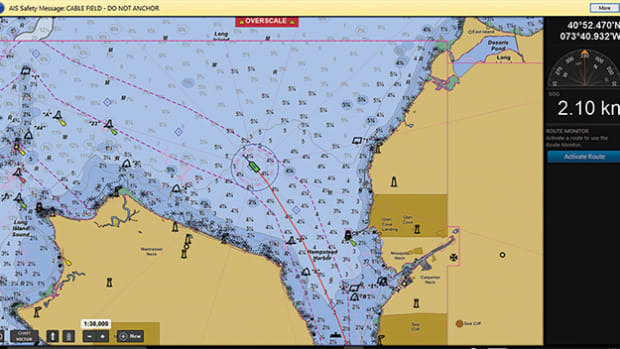 You only have to put one chart on and they can have that same chart across the Ethernet—if you make a waypoint on the flybridge display it shows on the charts down below with all the same contours.” The system can accept a wide range of electronic cartography too, so the limiting factor is user preference, not what the system accepts. That’s an important consideration in some far-flung cruising areas. 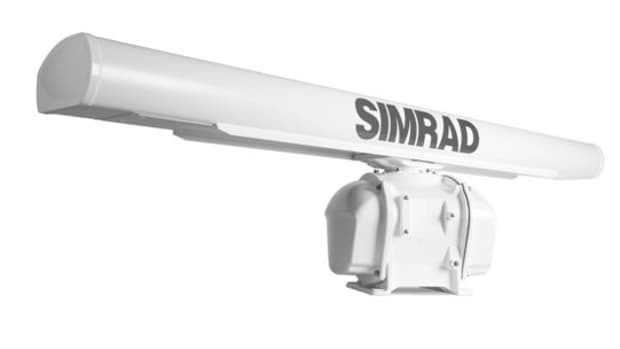 The following equipment list shows much of the Simrad equipment mounted on Arawak’s two helms. In conjunction with the radar system, it’s hard to beat communications for collision avoidance, and Arawak is equipped. 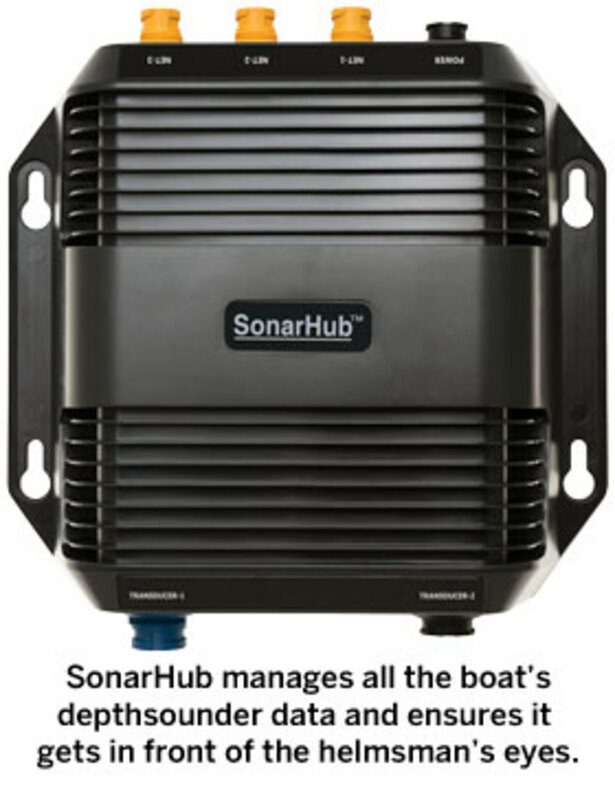 “We’ve added some other systems in the boat,” Cole says. “The AIS is functioning across the network sending the signal and also allows the user to be able to track those vessels and see which direction and how fast they’re going. You get the name of the vessel if you need to call him on the VHF. And of course we’ve got VHF radios: one fixed RS 35 at the upper helm, and an HS 35 wireless second station mounted below.” The second-station mic mounts on an induction charger and it’s always ready to go, connecting to the main fixed-mount via Bluetooth to provide full radio function (with the range of the 8-foot fixed-mount Navico 1710 VHF antenna) with handheld convenience from anywhere on the boat. The helm on Arawak has a lot of terrific cruising functionality, and even room to grow if her owner decides to do more with her. But to me the best part is that this equipment is set up to not age into redundancy. 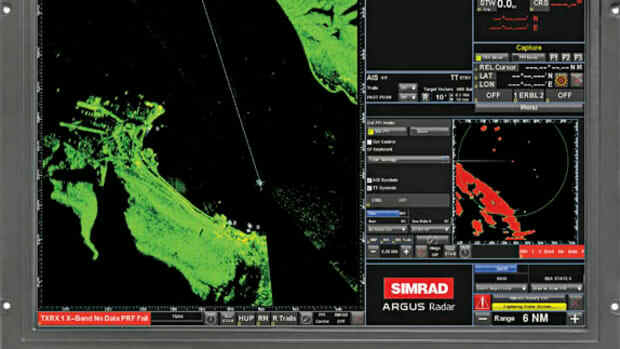 What’s new will stay new, thanks to Simrad’s commitment to software updates. 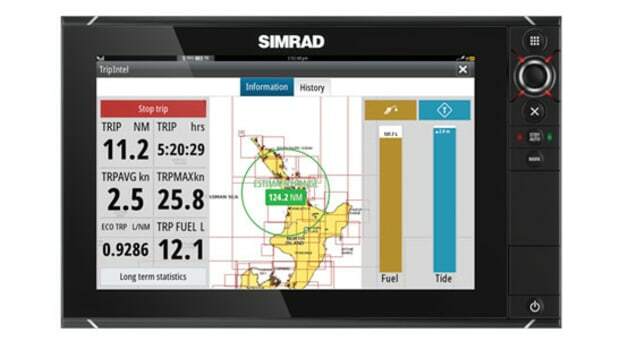 “Simrad does software updates at least three times a year,” Cole says. “Some of those times it might just be little features that may not make a difference to what you’re using. But we may have added several features that may be of value to you. It may not necessarily be the features that you’re looking for every time, but we also have software optimizations and bug fixes that can make the system work much more smoothly.” And with the GoFree Wi-Fi connection, software is easier to update than ever before—no more serial cables or even SD cards needed. This entire system makes it a joy to spend time on a good old boat like Arawak—really using her the way she was meant to be used, and with the twist of new technology. This article originally appeared in the May 2016 issue of Power & Motoryacht magazine.